I want to say that I’ve been photoblogging now for sixteen years – but I haven’t posted photos here very much lately, thanks to the lure of flickr. Maybe I should do something about that. Back then, before affordable digital cameras, I used an old 8mm camcorder and a video digitizer to get pictures into the computer. 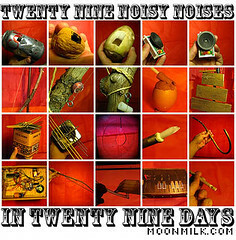 Just like I did the last two years, I’m going to spend the month of February trying to build a new musical instrument every single day. It’s not exactly a Stradivarius factory but it’s a lot of fun and a great learning experience. 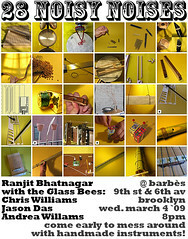 I have no idea what I’m going to do on February 1, and I’m trying not to plan ahead at all, but I do plan to finish off the month by collaborating once again with the Glass Bees!